CCC 115: According to an ancient tradition, one can distinguish between two senses of Scripture: the literal and the spiritual, the latter being subdivided into the allegorical, moral and anagogical senses. The profound concordance of the four senses guarantees all its richness to the living reading of Scripture in the Church. The Church teaches that the Scriptures carries up to four “senses,” then with that in mind, we can see two very obvious senses here. 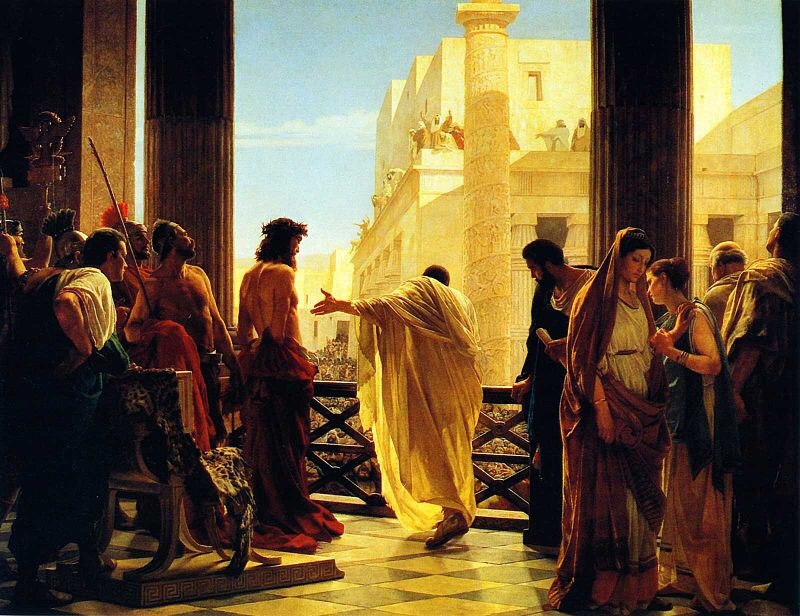 First, Pilate offers the criminal or Jesus, imagining that the crowd will choose the innocent man and not a murderer to release as a Passover pardon. Second, here we have two competing people called Jesus, one is the Messiah and one could be considered a false messiah. When Pilate offered these two competing messiahs, he tipped his hand as to which one he thought they should pick. He called Jesus “the one who is called Christ”, that word “Christ” is frequently thought of as Jesus’ last name, but in reality it was His Messianic title. The word Christ, comes from the Greek Cristos, it means “anointed one”, in Hebrew that word is Messiah. By referring to Jesus as the Christ, Pilate was acknowledging that some considered Jesus to be the Jewish Messiah. This must have infuriated the Pharisees, who reserved to themselves the right to say who was and wasn’t a prophet, never mind the long awaited Messiah. Now the chief priests and the elders persuaded the people to ask for Barab’bas and destroy Jesus. Even today we have people who entice us and stir us up to chose a mirage of the messiah. Sometimes the Jesus these people push sounds remarkably similar to the genuine one, whether it’s “never get sick Jesus”, the “be happy all the time Jesus”, or my favorite, the “all your bills paid off and no more financial trouble Jesus”, what we must do is measure every version of Jesus up against His Gospel. “Beloved, do not believe every spirit, but test the spirits to see whether they are of God; for many false prophets have gone out into the world. This is not to say that we should be skeptical of everything, but we should pray for the spirit of discernment, and if someone tells you something, or a homily doesn’t sound orthodox, then feel free to go to scripture and the teachings of the Church to “test the spirits” as St. John tells us to. I want everyone to be aware of false teachings. So when presented with Barabbas and Jesus Christ, you will know the difference and choose the true Son of the Father. This entry was posted in All Posts/Archive, Bible, Catholic Life. Tagged Apologetics, Bible, catholic, catholicchurch, Catholicism, Christ, christian, christianity, God, Jesus, salvation. It has been puzzling for me the Catholic Belief in the Blessed Virgin Mary’s Immaculate Conception. If we are to believe that Mary was “sinless”, either due to her innocence or holiness before ever conceiving Jesus; then she was the “first” of all human’s without the need for salvation. We have your illustration used above in another sense. Or, is the Immaculate Conception only in reference to Jesus and His ‘kind’ of birth? Perhaps you could, if willing, kindly explain how Mary being “the Mother of God” wasn’t always viewed as “completely” sinless since her birth? Your clarification would shed light on this subject for me and others. Thank you for any understanding you offer here. Timothy. Mary is believed to be sin less from the moment of her conception because God preserved her from “contracting” original sin (for lack of a better term). The best analogy I’ve heard for this is the puddle of mud. If you fall into a puddle of mud, God can reach down and pick you up. And then He can clean you off. Or, He can reach out and grab you before you hit the puddle. He saved you either way, but in one instance He preserved you from ever getting dirty. I hope that helps explain it. Thank you so much for your prompt reply! Yes, I finally do feel that I can now understand this belief. A fellow Christian (who IS Catholic) was telling me of his conversion to Catholicism due to his vision of Mary telling him that hers was an Immaculate Conception. He (as one who believes he is a “private prophet”) claims for the Lord God that Protestants are not ‘true Christians’. I personally pray for his opinionated mind. Is this the attitude and/ or position of Catholics towards Protestant believers overall? Again, your kind response in this regard would be most helpful. God bless you. Timothy. As with many things involving Catholicism, you have to first ask is that the position of the Church or of this individual Catholic. Is it the official position of the Church that Protestants are not “real Christians”? I can say emphatically that is a no. The Church prays that all will be eventually reunited in a single Christian Faith like Christ prayed for in John 17, but recognizes that some Christians are not in perfect communion with the Catholic Church, but are nonetheless members of the body of Christ. It is sometimes likened to an injured limb; still part of the body, but needing attention and grace to heal the wound that division has caused. Now we have to ask if individual Catholics see Protestants as “fake” Christians, and unfortunately some do. But like i said, that’s not the official position of the Church. It’s somewhat similar to how there are pro choice Catholics, even though the Church is unabashedly pro life.